Welcome to the SKA News Centre! The News Centre aims to provide a one-stop portal for all SKA media activities, including our latest news stories, multimedia content, newsletters and events. Press Releases are high-level information describing important scientific, technical and organisation developments and achievements, as well as important milestones reached by the SKA Work Packages Consortia. Press Releases are generally distributed via the AAS mailing list, AlphaGalileo and EurekAlert! as well as to the journalists and broadcasters who are part of our own SKA Mailing List. If you would like to subscribe to this mailing list, email William Garnier, SKA Director of Communications, Outreach & Education, detailing who you are, the media you are representing and providing your contact details (full name, phone numbers, email address). Announcements feature stories or events which are of interest to the SKA community. This includes announcing dates and locations of upcoming events, presenting new SKA eNews, and reporting on interesting developments within the SKA Work Packages Consortia which are not covered in Press Releases. The SKA welcomes journalists and broadcasters to its sites. Requests must be addressed directly to the SKA Director of Communications, Outreach & Education. Members of the SKA community at large can read the SKAO Bulletin, a bi-monthly update on the project and activities of staff at the SKA Organisation Headquarters at Jodrell Bank. 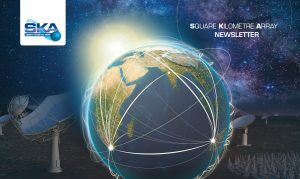 The SKA eNews is a quarterly publication informing about the latest events and news at the SKA Organisation and at the SKA partners, providing progress updates on SKA-related developments around the globe and promoting upcoming events of interest for the SKA community. This publication is intended for a technically advanced public and is the successor of the SKA Newsletter. You can read the latest SKA eNews here. We regularly attend events or conferences in order to raise awareness of the scientific objectives and progress of the SKA telescope project among scientists, policy makers, educational establishments and the general public. Find out about our latest events here. The SKA is a global organisation – its strength lies in the cooperation of international partners. This means that many groups and individuals work and communicate on behalf of the SKA. The brand guidelines contain rules for use of the logo and other elements of the SKA visual identity. The guidelines help all project partners to protect the SKA identity, and build uniformity and recognition across the project.